The following is a statement from the System Change Not Climate Change (SCNCC) coalition, in which Solidarity participates. SCNCC is organizing an Ecosocialist Contingent at the XL Dissent action in DC on March 2nd. For more information and to RSVP, please visit the Facebook event. On January 31, 2014 the State Department released its final environmental review of the Keystone XL pipeline, which outrageously claimed that KXL won’t worsen climate change. This clears another hurdle for the final approval of this disastrous project. After the release of the environmental review, the State Department has opened up a 90-day period for other federal agencies to weigh in on the project, as well as for public comment. After this period, the State Department will issue a National Interest Determination – a yes or no on whether the pipeline should be built. President Obama ultimately has to make the final decision. Activists are gearing up for a fight, and we aren’t backing down. The movement has successfully delayed approval of the pipeline, but with all signs from the administration pointing toward approval, it’s clear we need to ramp up our organizing. And this is exactly what is happening: #XLDissent, on Sunday, March 2nd in Washington, D.C., will be one of the largest actions against the Keystone XL pipeline so far. People will be engaging in what might be the largest act of civil disobedience in American history. System Change Not Climate Change will be there, marching in an Ecosocialist Contingent alongside thousands of fellow climate activists, students and youth. We demand not just rejection of this pipeline, but a shift from dirty energy such as the tar sands, fracking for natural gas and coal to a renewable energy such as wind and solar. We have no illusions that such a shift will occur on the initiative of President Obama: his interests lie with the ruling elite and energy companies. Instead, we look to the new generation of environmental activists who are eager to connect the fight to save the planet with the struggles against the school to prison pipeline, the oppression of indigenous peoples, mass incarceration, immigrant rights, racism & gender oppression, and even capitalism itself. 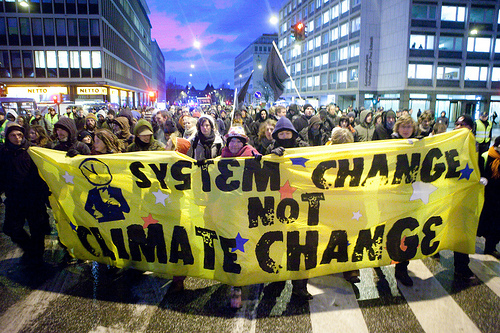 System Change Not Climate Change: The Ecosocialist Coalition believes that the ecological crisis results from the capitalist system, which values profits for a global ruling elite over people and the planet. It must therefore be confronted through an international mass movement of working people around the world, fighting for social and environmental justice. We must replace capitalism with ecosocialism: a democratic society that’s based on fulfilling human needs and preserving earth’s ecology. We invite anyone who agrees with the need to challenge capitalism to join the Ecosocialist Contingent at XL Dissent. For more information please visit the Facebook event page. And, if you’re in DC on Thursday, February 27th, check out SCNCC’s public forum, Resisting the Keystone XL: Fighting for Climate Justice! We are seeking organizational and individual endorsers for the Ecosocialist Contingent. To endorse, please email systemchangenotclimatechange@gmail.com.